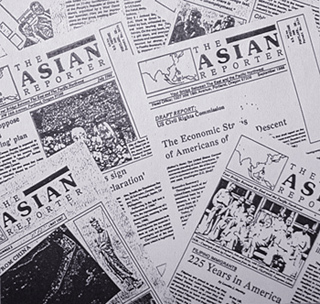 With its goal of bridging the gap between Asian and American cultures, The Asian Reporter weekly newspaper is an influential component of the Asian-American diaspora in the Pacific Northwest. By writing about and presenting the virtues and differences of Asian and American cultures for future generations, the newspaper continues its work toward achieving its primary objective. Celebrating its 15th year of publication, the newspaper is an important catalyst in fostering understanding among the continuously evolving Pacific Northwest communities that share an Asian heritage. 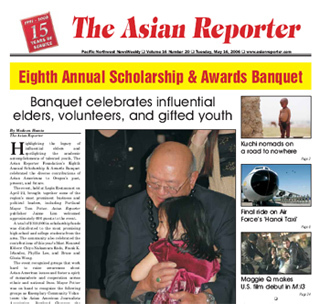 “It is an honor and privilege to be able to highlight the achievements and successes of some of the members within the Asian community while at the same time informing the mainstream population about Asian people, their culture, and values,” said Jaime J. Lim, publisher, who heads the family enterprise that produces the weekly newspaper. History. The Asian Reporter's roots were in a very small, limited community newsletter of the Filipino-American Association of Portland and Vicinity. 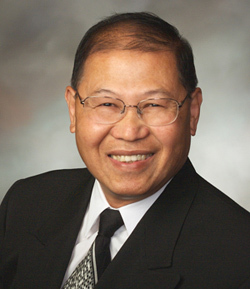 When Jaime became president of the Fil-Am Association in 1978, he edited the "Fil-Am News Balitaan" for two consecutive one-year terms. That is when he dreamed up the idea of expanding the newsletter's coverage to other Asian communities in the Portland area. His dream became a reality in the late ’80s with the help of his brother and his family. The first issue was published in March of 1987 as the Fil-Am News. By May of 1987, The Asian Reporter name was born and the paper was published through 1989. After a two-year hiatus, The Asian Reporter was officially re-introduced in tabloid format in January 1991. The paper began bi-weekly distribution in 1992, and in January 1995 the publication moved to weekly distribution. From these meager beginnings, The Asian Reporter has grown from a community-based paper to being the Pacific Northwest's source for international, regional, and local Asian news. “Our goal was -- and is -- to provide a publication that is committed to highlighting Asian news, events, issues, and interests,” said Jody Lim, who oversees advertising and other duties for the newspaper. A Family Affair. The Lim family continues to run and operate the newspaper, in charge of editorial, advertising, marketing, and various functions for the newspaper. Since its rebirth in 1991, The Asian Reporter has grown in size, readership, and content, as well as in distribution and focus. Available every Tuesday, The Asian Reporter publishes 20,000 print copies in addition to posting the entire newspaper on the web to reach a diverse group of readers -- about 65 percent Asian and 35 percent Caucasian and other. The Asian Reporter’s website features an archive of past stories, book reviews, columns, and more. It also includes a resource section that contains scholarship opportunities and lists contact information for community organizations, associations, and churches in addition to consulates and government agencies. Print copies of the weekly are distributed through community businesses, restaurants, coffee houses, public agencies, community organizations, churches, curbside newsstands, subscriptions, and other venues. “We’re proud of how we’ve grown The Asian Reporter throughout the years. We are now able to connect the mostly immigrant Asian population in the region with what is happening in their mother countries as well as locally in their own communities,” Jaime said. According to Jason Lim, who manages the newspaper’s public relations and marketing outreach, expansion of the newspaper’s circulation across cities and towns in the Pacific Northwest is the long-term goal. Leveraging The Asian Reporter brand and recognizing the need for new avenues to serve the Asian-American community, The Asian Reporter Foundation was established in 1999. Since its launch, the foundation has awarded scholarships to promising college and high school students. The annual Scholarship & Awards Banquet draws hundreds of attendees from corporations, government agencies, philanthropic organizations, and the community to support and witness the honoring of Asian elders and recognition of community groups for their volunteer efforts. In 2003, the foundation began hosting AsiaFest, one of the premier cultural events in the region showcasing the diversity of Asian-American cultures. The annual AsiaFest event welcomes thousands of participants to the Oregon Convention Center to a one-day exhibition of Asian culture and tradition. Families from various ethnic backgrounds enjoy the wide array of offerings, from traditional dance performances to authentic Asian cuisine, with an opportunity to browse arts and crafts and information booths. “Establishing the foundation provided us the opportunity to expand into other areas and increase and enhance our service to the Asian-American community,” Jason said. Click on the links to learn more about The Asian Reporter and The Asian Reporter Foundation. Small businesses are the lifeblood of the economy, and many small businesses continue to be family-owned and operated. If you own or are part of a family business that you'd like to see profiled in Colors of Influence, write to us.